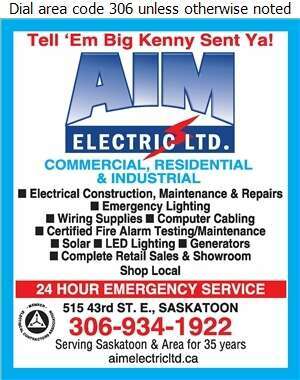 AIM Electric is Saskatoon's premier electrical contractor. Locally owned and operated, serving Saskatoon and Area for over 30 years. AIM Electric will take on your commercial, residential, or industrial electrical projects. AIM's bonded electricians tackle all jobs - new construction and renovations, big or small! For electrical maintenance and repairs, think AIM Electric. Call AIM today - and tell 'em Big Kenny sent ya!